Yes folks time is moving on and as the season of good cheer comes closer our thoughts may be of Christmas Day and having a great Christmas dinner with family and friends. So why not do just that by coming to Al Shaheen in Karakum for that big seasonal feast with great company in a very homely atmosphere. Make your choice from the menu below call me, Imtiaz on 0533 842 2784 or 0392 842 2784 to book your table for a great Christmas Day Lunch. 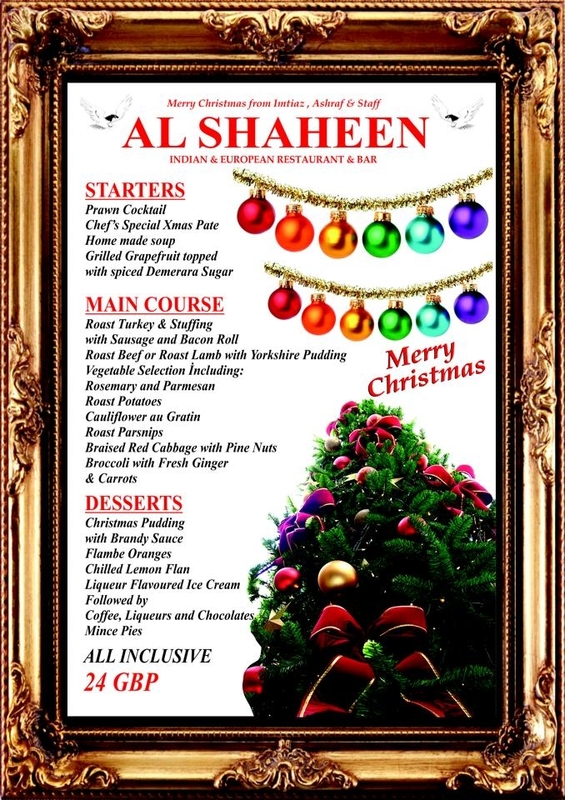 This entry was posted in Special Events and tagged Al Shaheen Restaurant, Christmas, Christmas Day, Lunch by kyreniacommentator. Bookmark the permalink.